I was tidying up my old files in my laptop when I came across this. It brings back some scary memories because I was in Malibu and had to evacuate from my host's house because of a bush fire that spread rapidly in the early morning. We "escaped" to my host's friend's house and the grandmother of the house started painting from a photograph. Her prolific paintings in the house inspired me to paint something too, since I pretty much had nothing to do other than to watch the depressing fire spread from one house to another or watch a movie I've seen before. So I sketched this out in pencil and then painted it in acrylics in 4 hours (I think). When the painting was done, it was time to go wandering again, to see if we can return to our house safely. This was an image that I wanted to paint for a long time, either because it was my past life persona, or the image just flew to my head and stuck there. I thought the way her face and profile looked was extremely beautiful and melancholy in its simplicity (which was the emotion I was trying to depict, not that I'm praising myself). I liked that I chose the blue paint for her face and not black, which would be too harsh. 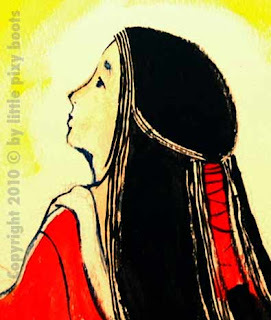 I was careful to draw her slightly plump too, which was a sign of beauty in that era of Japan. Kanzhu means watching the bamboos. I'm not sure why she is watching the bamboos, but they might signify freedom to her. Maybe she was trapped in her rigid life in the palace. 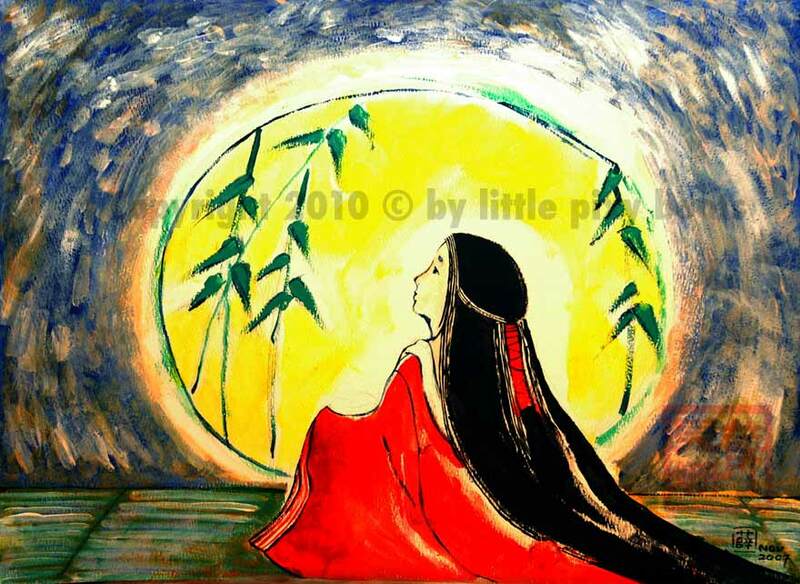 Yet the serenity this painting has, is almost like the peace I feel in meditation. Gosh, hope this wasn't too depressing on an Easter day.